One problem that many language teachers face is the dilemma of how to create and grade speaking homework. I know colleagues who have simply told students to practice by having a conversation with someone on a particular topic, and although this would certainly be beneficial, there is no way to hold students truly accountable. I attempted to create a solution based on what I had done as a language learner in the AP Spanish classroom. To prepare for the test, occasionally we would be given a recorder and we would have to say our responses into the machine that we would later give our teacher. To update this, I would have students use their phones to record, such as in the free Voice Memos app on the iPhone and then email me their response. While this did help to solve the accountability and tracking issues, it still wasn't streamlined. The questions were given separately. Students needed to input my email address correctly. If I wanted to have them record more than one response, they might be submitting multiple files, creating disorganization in my own inbox. In other words, having multiple steps meant there were any number of things that could go wrong. But last year, my school had a professional development workshop on a new, free app that solves all of these issues. It was the first time I'd ever heard of Recap, but now I have made it a standard part of the weekly homework I assign to my classes. How Can I Get Started With Recap? Simple! First, you will need to sign up for a free account. Fill in the relevant information, including the email address you want to link to your account. Next, click Add Class. You will need to create a title for your class and select the way you would like students to sign in. It is that easy! Now you are ready to create your first assignment. Hit Add Recap (the green button) on the right-hand side. You can type your questions and they will appear as text or you can record yourself asking the questions for students to watch. Once you've input the questions you want, click the green next button towards the bottom of the screen. Select assign to the whole class (and you also here have the option to assign it to multiple classes if you have multiple sections of the same course). Select the amount of time students are allowed to speak for (the default options are 15, 30, 60, and 120 seconds). You will also need to select a due date. I personally like to leave the Assess Yourself poll on because it allows students to do a short bit of reflection as well. Click the green send button. You've created your first speaking homework! Great work! Once the student responses come in, you can watch the responses by yourself and give them a grade and feedback just as you would have done with the recording sent from a mobile phone. While this is good, doing this means you aren't taking advantage of one of the most interesting features of the app: the highlight reel. Foster competition for the best response or the most creative answer by telling them that from the class only a few will be selected for the highlight reel. I like to also give out extra credit points for some added incentive. Play the highlight reel for the entire class and after the responses have the students that watched point out what made these responses so successful. This is particularly useful if you have students preparing for a standardized test like the TOEFL. Knowing the components of a strong response can be half the battle on those exams. Though the training that I attended was not specifically for language teachers, I think that Recap is particularly well suited for the language learning classroom. Because Recap lets students respond to open-ended prompts, questions that make good writing questions will also make strong speaking questions. Encourage students not to write out their entire responses, but just to take notes just as they would do on something like the TOEFL. For teachers working with lower level ESL students, you can create prompts that allow them to show off their knowledge about specific grammar structures, like explaining what they did last weekend after your class had completed a lesson about the past simple. For TOEFL teachers, the amount of speaking questions 1 and 2 that you can generate and assign to students is nearly unlimited, making this such a valuable tool. Have students focus on speaking clearly and fluently in addition to giving answers that are grammatically correct and fully answer the question. Go beyond the obvious. Have students work in pairs and submit a conversation that they have created. This app would be an outstanding way to preserve role-play activities. Do you teach English Language Arts (to native speakers or non-native speakers)? I have given students creative assignments related to the novel or short story we are reading and told them to use Recap to record their creations. I've had students play the part of lawyers giving opening remarks or recording artists making a song or rap, and this app was a great way to submit these recordings. In the coming weeks, I'll be using this app to have my English I class record a slam poem, and I know the results will be amazing. Although this technology is great for capturing creative work, it also can be leveraged to show more concrete understanding of facts. It can be used to review key concepts from class or reading passages. For classes full of students that are reluctant writers, I find Recap particularly useful for giving students a different outlet for expressing their opinions. They can back up their thoughts using information from the text without the pressure of writing a paragraph or an essay. Whether you use Recap to modify assignments to create scaffolding to better fit student needs, to allow non-native speakers additional speaking opportunities, or to streamline the process of recording and submitting creative assignments, Recap is a handy tool to integrate into your classroom. Want to make grading student work even easier? Use the printable Recap Speaking Rubric I created. It uses many of the same criteria that TOEFL scorers look for. And it's free. Thank you! Click here for your Recap Speaking Rubric. 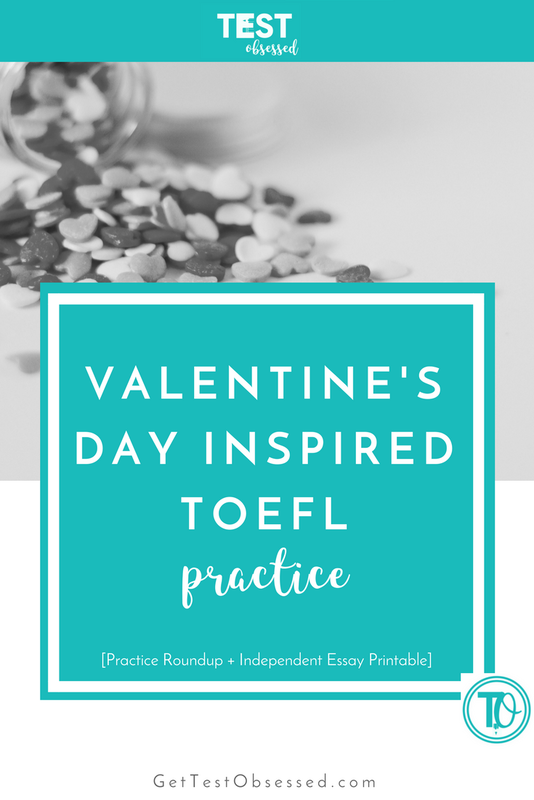 Be sure to check your email for more ESL & TOEFL teaching tips! As ESL teachers, most of us assign reading and writing homework primarily. While these are obviously fundamental skills that students need to practice, they are also typically the easiest types of tasks for instructors to assign. Listening and speaking practice shouldn't lag behind because they are more difficult to assign to students for homework. In fact, by embracing technology and leaving the CDs behind, you might find that listening homework is one of your absolute favorites-- just as I did-- after discovering ESLvideo.com. For me, ESLvideo.com was a total game-changer in my classroom. I had virtually given up on assigning TOEFL-style listening homework because often the students had purchased used books. Though using Amazon or Chegg is a great way to get textbooks at more affordable prices, sometimes used books don't always come with all of the pieces they should, such as the CD with the recording of the lectures. Other times, even though students had taken the time to buy a used version of the book that came with the CD, the disk would show up broken or scratched, rendering it unusable. As an alternative, I would sometimes assign students part of a documentary to take notes on. Although note-taking practice is always beneficial, it wasn't quite as realistic to the test. That is when I found ESLvideo.com, which allowed me to ask students to take notes and answer TOEFL-style questions. The best part was that I didn't even need to worry about collecting paper or walking around the room to see that everyone had completed the questions for homework. By signing up for a free teacher account at their website, students could directly send me the results. So, do you want to assign your students listening homework that is level and age appropriate that gets graded automatically? I've led in-person workshops training other ESL instructors how to use this website, and I want to give you a tutorial as well so there is no excuse not to use this amazing free tool in your classroom. Also, it is extremely easy to use-- very little learning curve for the website. So head on over to ESLvideo.com. Click on Register and fill out the information. Select a username that makes sense for you and your students because students will be able to use the Teachers tab in order to find you and this is organized by username, not first name/last name. At this point, you should definitely create a Teacher Code. This is what your students will type in in order to send their results to use. Simply select a code that will be easy to remember and update your account. If you want to be really fancy, you can customize features of your Profile. After you've registered and logged in, click Teacher Page to add your website and a profile picture. You can even link a video or create a message for students who look at your page. These features could be an excellent advertising opportunity for driving traffic to your website, especially if you are interested in starting some type of online tutoring business. Now that you've created an account, you can find an already existing video to assign to your students or you can create your own practice questions for your students. Do you want them to focus on grammar or content? The quizzes are really flexible so you will find many different styles that already exist. Also, what kind of listening do you want students to do? Would they benefit from hearing a lecture or a casual conversation between friends? For me, I wanted to make my listening practice as similar to the TOEFL as possible, so that was my starting place for step 2. As a result, I knew that Ted.com lectures would be a great option for me because they are academic in nature. I would pre-screen the videos for content that seemed similar to TOEFL content, which meant I needed speakers that had good speed and pronunciation. Click on the gray Create Quiz tab. Copy and paste the embed code from your video's website (on YouTube, Ted.com, etc.) into the box on ESLvideo.com. You will then need to title your video. Your videos will all come up on your teacher page together, so you might want to number them if they should be viewed in order or give them some type of organization. Use the description and tags features to help other ESL teachers and students find the awesome quiz you have created. You must also upload a thumbnail for your video. Videos from YouTube will already have thumbnails created, but you could also make your own using a free tool like Canva. Once you've clicked the radio buttons for the appropriate level, language, and quiz type, hit next. Step 4. Create your questions. I love to create TOEFL-style questions for my students. The limited amount of quality TOEFL listening material out there makes this a necessity for my classroom. However, ESLvideo's platform is quite versatile, so you could craft questions that test grammar topics, minimal pairs, or common collocation recognition. It is easy to get your quiz in front of your students. If you have a website, you can actually embed the video and questions directly into your site. If that seems intimidating, you could also post or email the link to your students. Students can also go to the Teachers section of ESLvideo and see all of the quizzes you've posted in one spot. No matter how you choose to distribute the quiz, make sure that your students have your Teacher Code. After they take the quiz and get their results, this will enable them to send their scores directly to you. With ESLvideo, making in-class listening practice or assigning listening homework couldn't be easier. It is free for you and your students, and the quizzes are automatically graded when students answer the questions. Love the idea but don't want to make your own quizzes? Sign up below and get notified each time I post a new quiz!